Powerful auto-harmonising, but requires a moderate knowledge of music theory. Can be very convincing. Interface very streamlined. Powerful if you know what you want. Very versatile. Not incredibly user-friendly. Not very suggestive interface or manual. With expanded MIDI functionality, an improved core engine and more, does v2 of zplane's acclaimed harmonising plugin deserve your attention? Working with vocals brings its own set of logistical problems. What if your singer has gone home when you decide the track needs harmonies, or they just aren't adept at laying them down? Or perhaps you're working with pre-recorded samples, and you'd like to add a harmony to a single-line melody. It's for just such situations that zplane developed their vielklang Instant Harmony plugin (VST/AU/RTAS). Now at version 2, its interface has been overhauled since we looked at v1, and a number of key new features have been added. "Version 2 permits the import of multiple files at once. Now, a verse, chorus, bridge - anything you like - can be laid out in the arrange window"
Version 1 offered up to four channels of intelligent harmonisation, and at the simplest level, it only required you to drop your audio file into the plugin, whereupon it made an eerily accurate guess as to the key. Version 2 goes further, though, permitting the import of multiple files at once. Now, a verse, chorus, bridge - anything you like - can be laid out in the arrange window. You then enter the tempo, hit the Harmonize button and enjoy some incredibly convincing harmonies. These can be viewed and edited in a piano roll editor - you can delete, move, draw and add new notes, as well as apply vibrato and tremolo to individual notes. Its this piano roll functionality that makes vielklang Instant Harmony 2 more powerful than many of its competitors. When you have a harmony performance you're happy with, you can export each part as a separate audio file, or even as a MIDI file. Version 2 also introduces MIDI file import, enabling you to turn something like a simple lead synth line into a huge harmonic monster that can then be exported as a complete MIDI file. We find this plugin at its most usefully suggestive when applied to a vocal before any backing music has been added. It then doubles as a compositional tool because many of the suggested harmonies will also make good starting points for backing tracks. It's often less useful when your track is up and running, though, as the results can need serious editing. "Another ingenious feature is the ability to take snapshots of specific harmonies, assign them to MIDI keys and then trigger them"
Another ingenious feature is the ability to take snapshots of specific harmonies, assign them to MIDI keys and then trigger them, letting you perform harmonic progressions live via MIDI. Then there's the formant control, chord menu, MIDI harmony control and numerous other powerful features. It all really is as magical as it sounds, but it isn't perfect. Despite being redesigned, the interface is a little clunky; it doesn't feel as slick as the likes of Melodyne and Harmony Engine. In terms of sound quality, we pitched vielklang against some of the leading harmony- generating plugins on the market, and it was at least as good, if not better. When used constantly, the results of harmony plugins - understandably - sound a little robotic, but with careful mixing and sporadic use, the sound is very convincing, particularly when used in electronic productions. 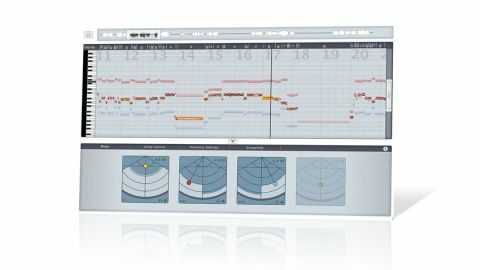 vielklang 2 is an insanely clever bit of kit and a big step forward from version 1 (we haven't even had time to mention the additional scales or new harmonisation types). Whatever your skill level, it can be genuinely inspirational, especially with the new MIDI harmonisation. However, if experimentation and/or music theory give you the fear, you may not find vielklang 2 quite so welcoming or intuitive.